“Innovative people are curious. They experiment. They discover. They dare to be different and are not afraid to make mistakes”. Excerpt from “Nurture a our Creative Spirit”. I love to play and experiment and often get lost in the creative process. Several years ago I purchased a felting machine on a whim. Not content to felt only wool, which is standard, I decided to experiment with all types of fabric and fibers just to see what would happen. 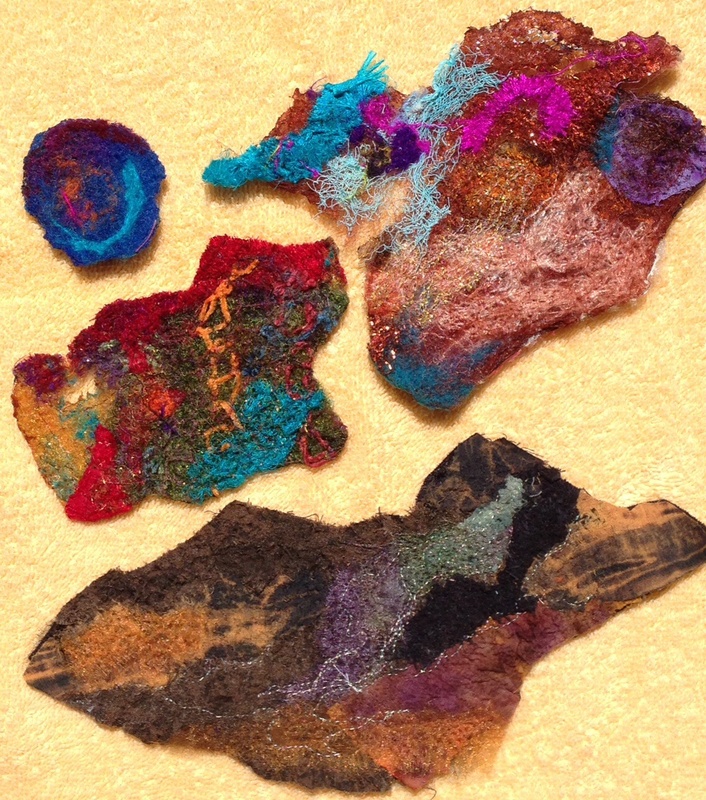 I had a great time playing and discovered how to make fun collages through felting. My experiments resulted in creating my quilt, Against All Odds. The tree and leaves are a felted collage of materials including cotton, wool, wool roving, silk, silk roving, and cheesecloth, among others. The photo below contains some of my felted collages including clockwise from top left: A center for a flower; a collage demo from a class; a sample of felted tree bark from Against All Odds; and a collage I intend to use on a handmade notecard. Are you fearless when you are create? Has any of your experiments led to exciting effects in your artwork/quilts? Tags: art, cheesecloth, collage, Creativity, felting, quilting, wool | Permalink.